Our regular discount codes or 20% off referral codes cannot usually be applied to subscriptions that are due for renewal. 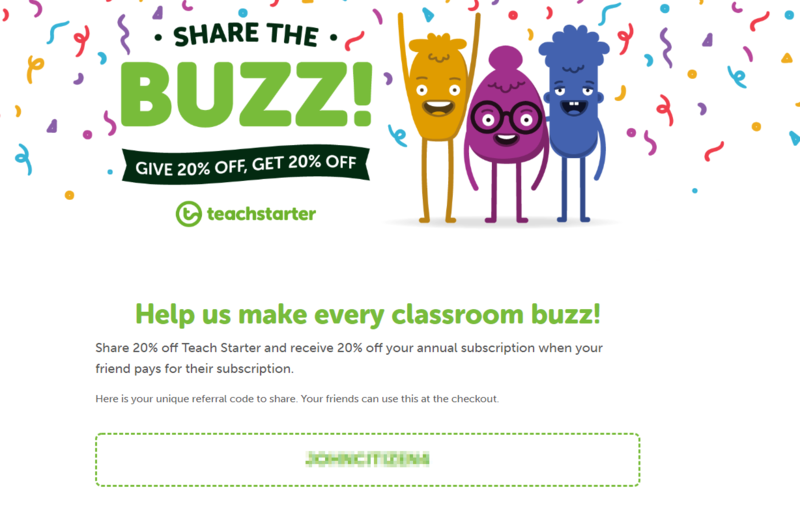 You can receive 20% off your next renewal every time someone signs up to their first paid Teach Starter plan using your Share the Buzz referral code. Not only will they receive 20% off their first subscription, you also receive 20% off your next renewal, up to a full 100% off your renewal if 5+ people redeem your code. Will My Referral Credits Rollover to Next Year? No, your referral credits do not rollover to the following year. If you have 13 people use your code between you signing up on February 1st, 2018, and your account renewing on February 1st, 2019, your subscription will be free for this year. If nobody else uses your code between February 1st, 2019 and January 31st, 2020, however, you will be charged the full cost of your subscription for this renewal year. You can find your referral code by visiting the Share the Buzz page. Your discount code will be visible in the middle of the page.